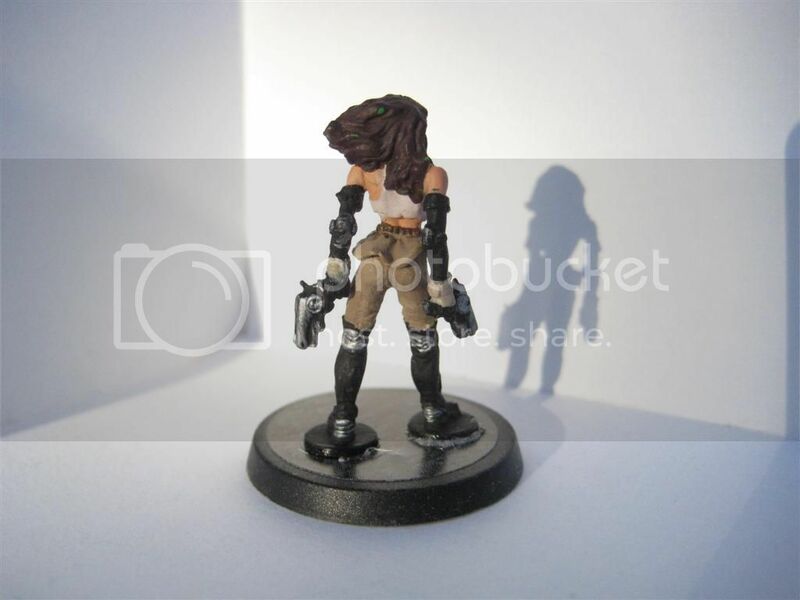 Painting figures was a pretty intimidating premise for me. 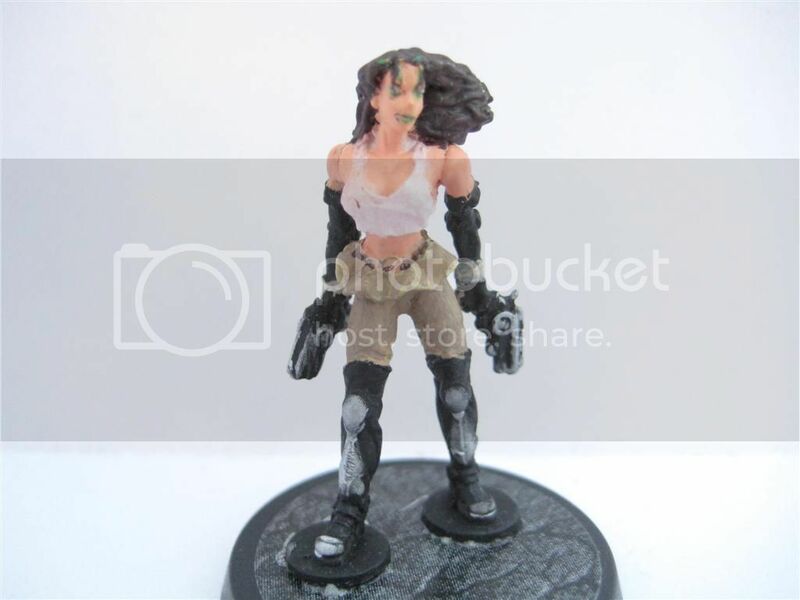 However, after reading a lot of stuff here and getting excited about some of the awesome work I saw, I gently stepped into figure painting. 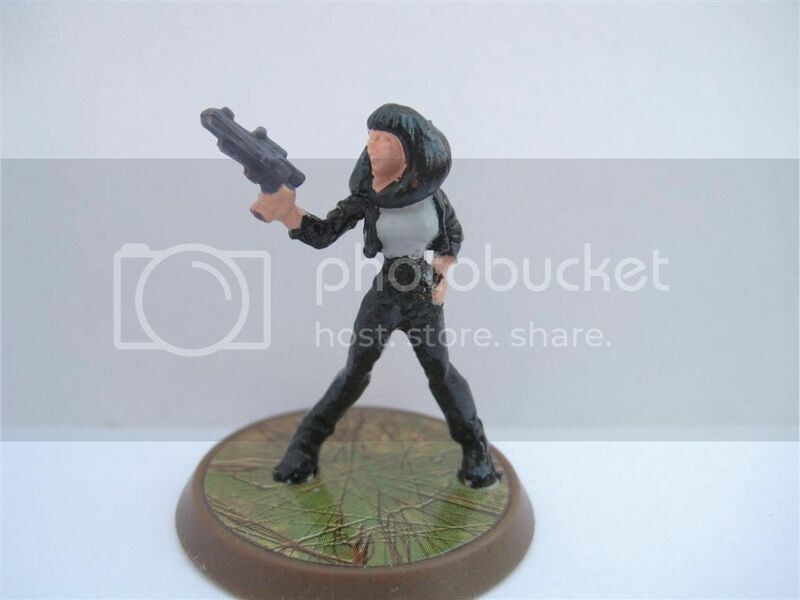 My first attempts were simple repaints such as Agent Skahen. 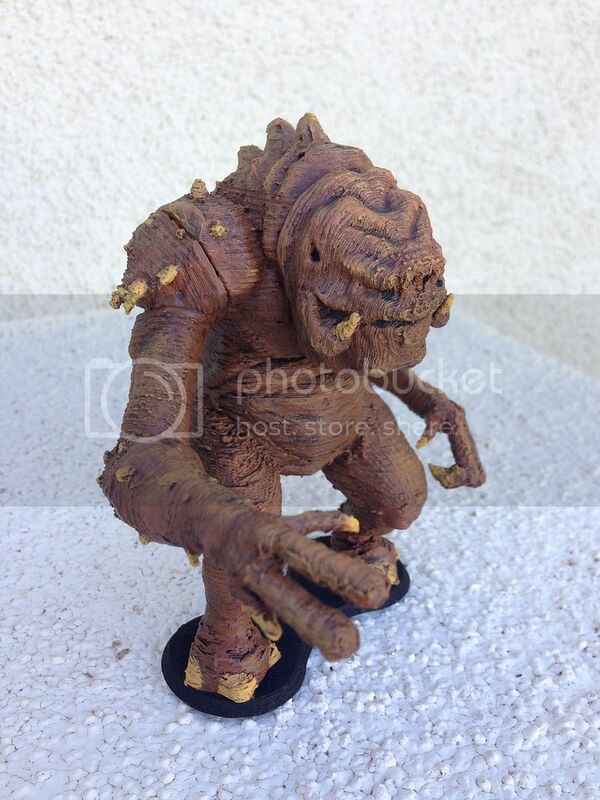 After reading up on more techniques such as drybrushing, washing and highlighting, I attempted more and more difficult projects, which gradually increased my skill and confidence. 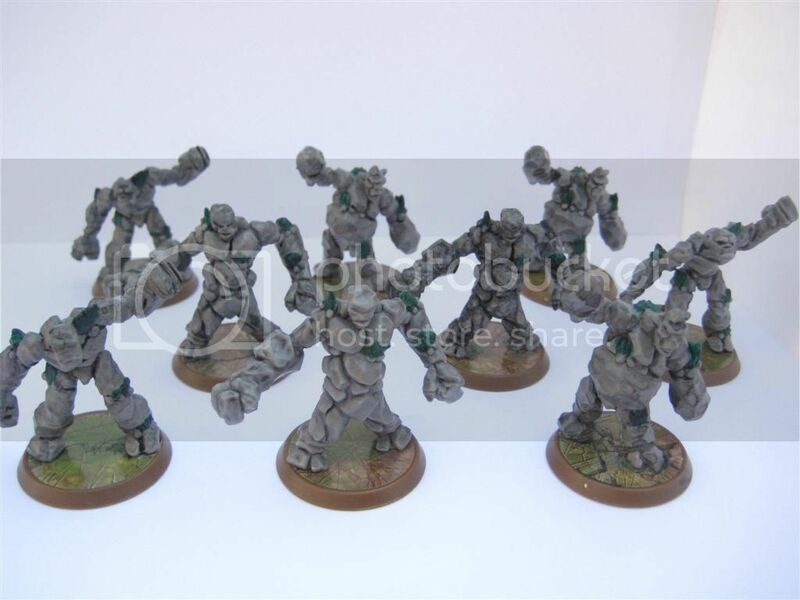 -Games Workshop books about painting Warhammer figures. 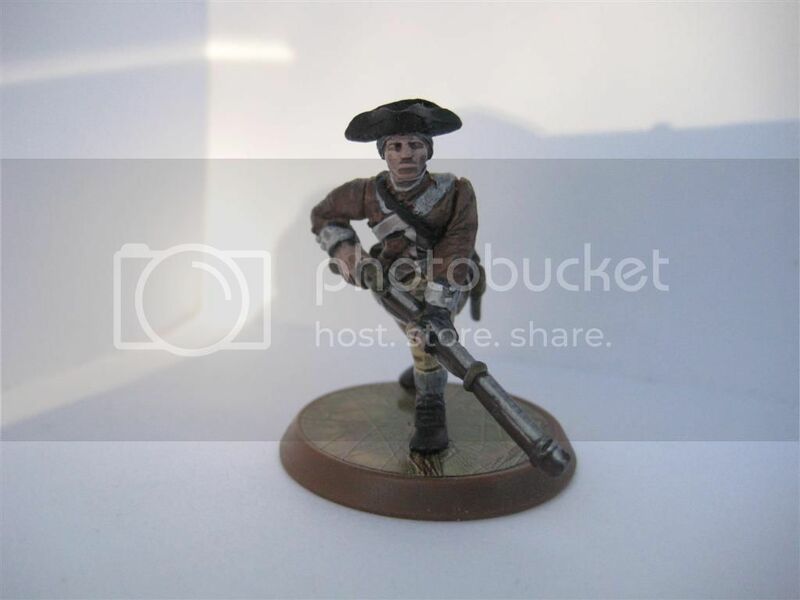 -www.miniwargaming.com has some really excellent figure and terrain tutorial videos. Many of them are in the Members Only Vault, but if you get on their email list, they frequently offer free trial memberships to the vault and free downloads of some of the tutorials. 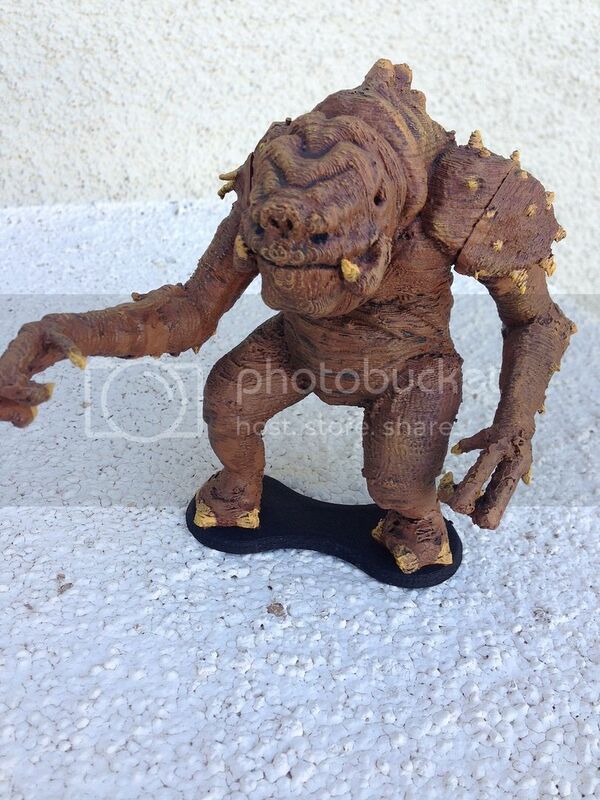 White Knight graciously sent me a Rancor Monster (in pieces) that he printed on his 3D printer. I assembled it and finally finished painting it. This one is quick and easy. I painted over the figure with "Grape" with a little bit of "True Blue" mixed in to darken it, then dry brushed with "Grape" mixed with a drop of white. Hulkbuster is a Handful of Heroes figure that I painted red, then highlight with yellow, then wash with black (or maybe it was brown). 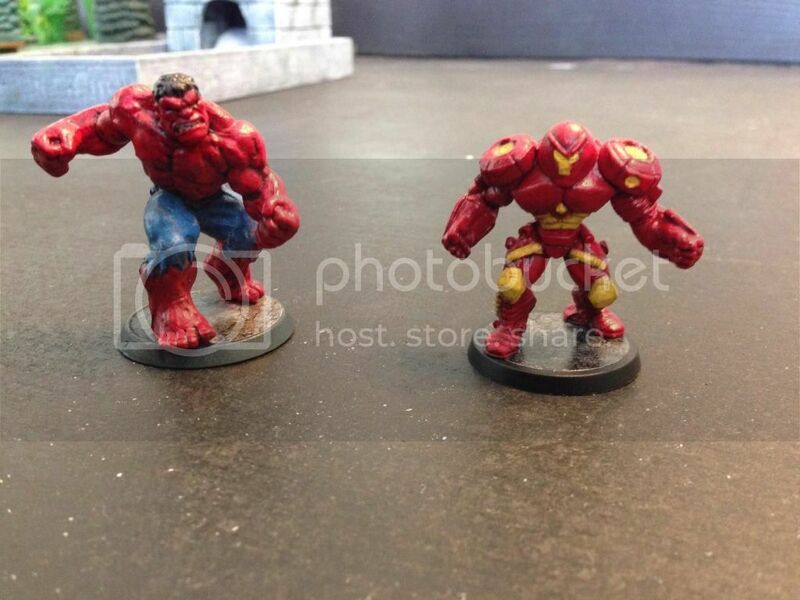 The Red Hulk is a repaint of the Hasbro Hulk figure. Paint red, pants blue, touch up on hair and teeth. Wash with a dark red/brown. 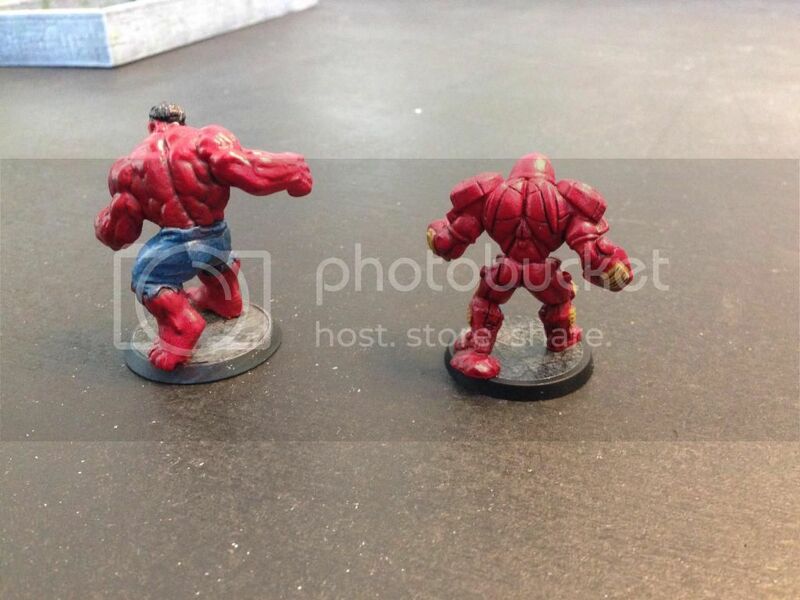 Drybrush a bit with red on the hulk's skin, and with white over the pants to make them look like a worn pair of jeans. As part of a trade, I repainted two squads of Obsidians into Granite Guardians for someone. Here they are standing with a squad of original Granites. Can you spot the real ones? Paint all over with metallic blue paint. Then paint the detail lights, eyes and chest lamp red. Finally, using a very small brush with a tiny speck of pink paint on the tip, gently dab it into the middle of each of the red lights. 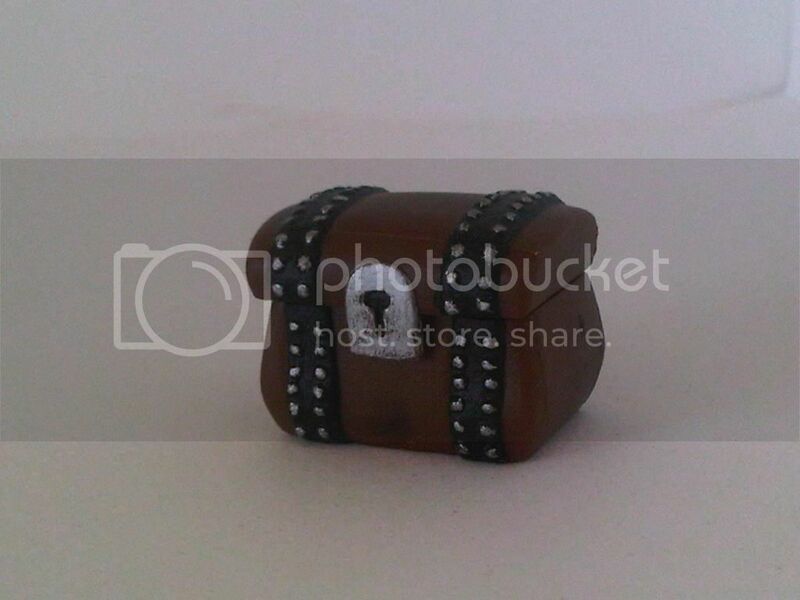 This is a chest from my kids' toys, Littlest Pet Shop, I think. It was originally plain brown. 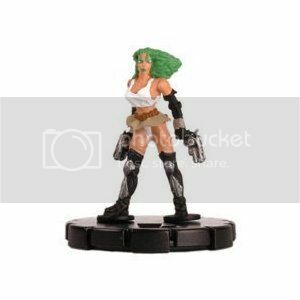 This is an expensive Heroclix figure, so I copied Griffin's idea. 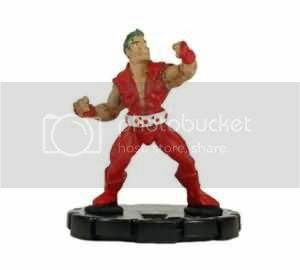 Cut off the head of the Heroclix Ray figure and replace it with the head of the Heroclix Doc Samson figure. Then I shaved off the lines on the chest with the Dremel. 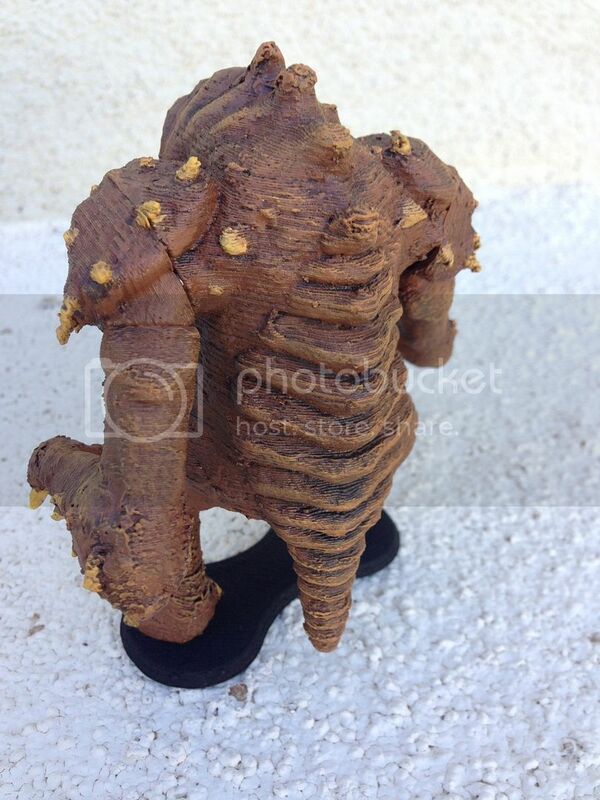 Next paint the arms, legs and body black as a base. 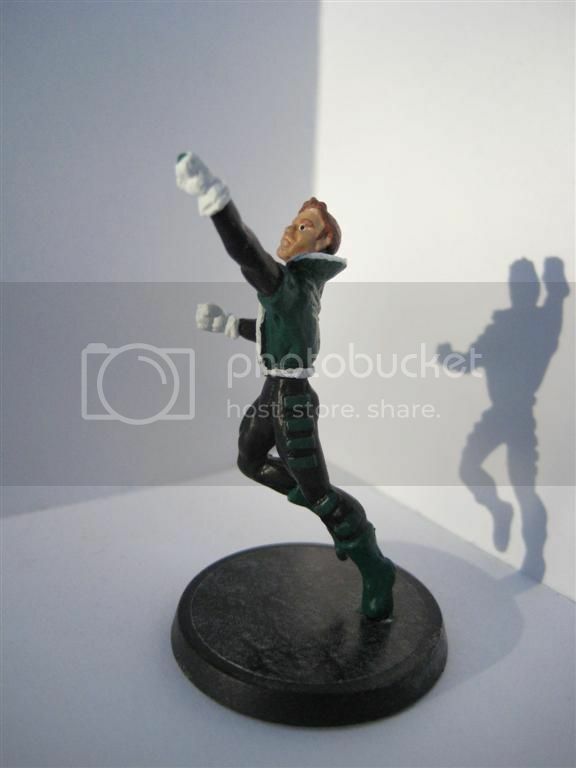 Paint the jacket and boots green, as well as the bars on the sides of his shoulders and legs. 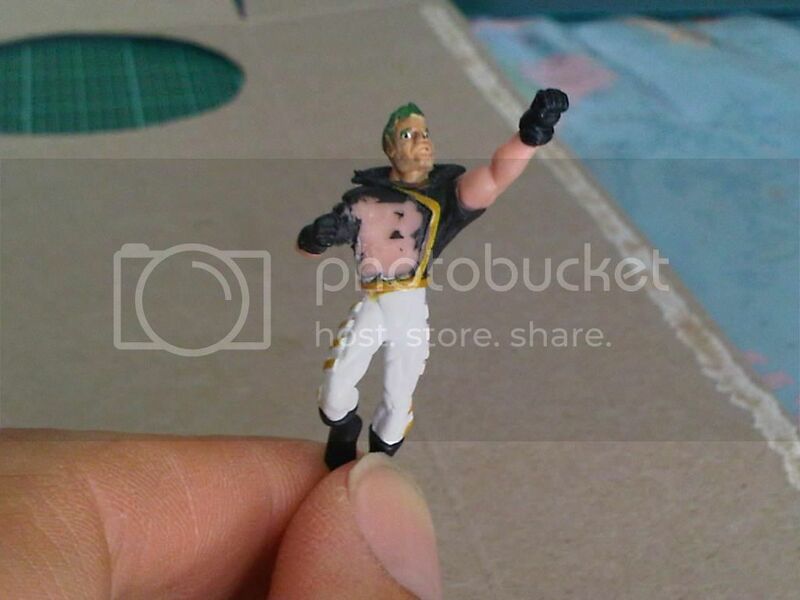 Paint the gloves and the trim around the jacket white and freehand the Green Lantern logo onto his chest. Don't forget to add a green dot for a ring. Finally I painted the hair and eyebrows a reddish brown color and then washed the the hair with a darker reddish brown color because it didn't look very natural with just one shade of color. This one is fairly simple, just look at Rocktroll's guide where he quotes Grungebob on the colors to use. 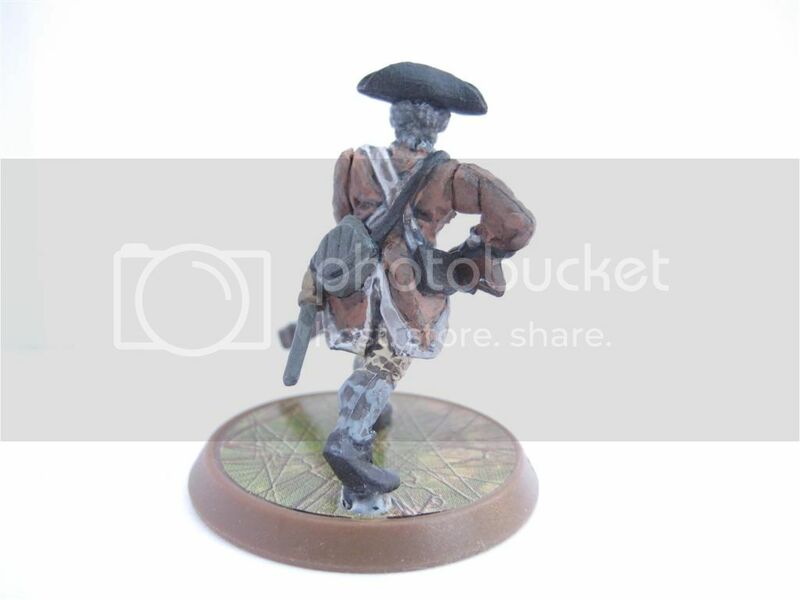 Basically just repaint the coat, hair, hat, knife, canteen and canteen strap, then coat with matte finish sealer. For the hair I painted it light grey, then added a darker grey wash to it to fill in the shadows between the strands of hair. This simple step makes the hair look MUCH better. This idea was ripped off from the Griffin Paints thread. 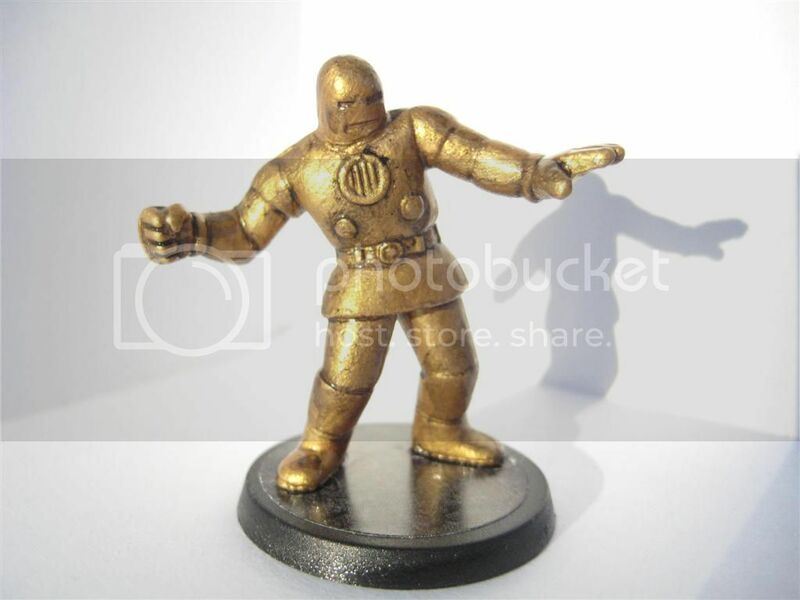 These Iron Men are from the Handful of Heroes packs, but I just went and bought them from somebody on eBay. 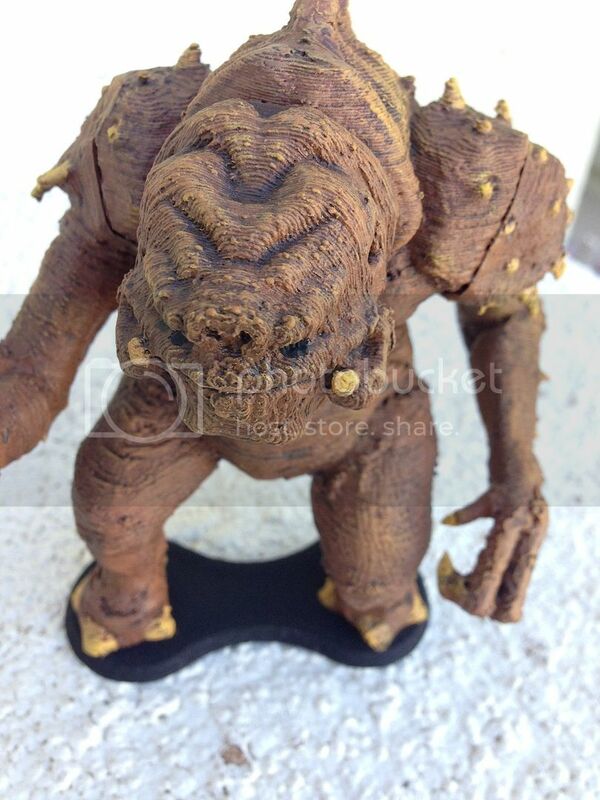 This repaint is easy, just paint silver or gold, wash with black, and then coat with something shiny. I used Krylon Clear Glaze. 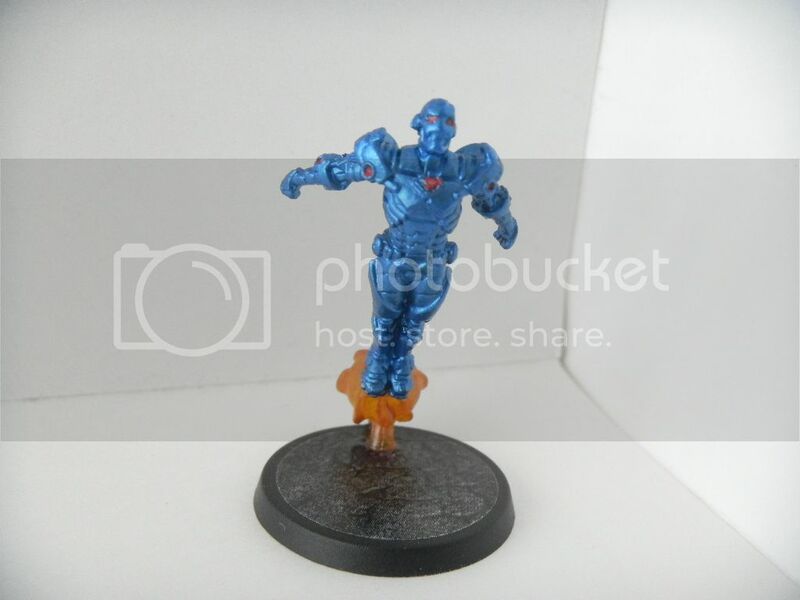 This is the Heroclix Blue Lantern?? 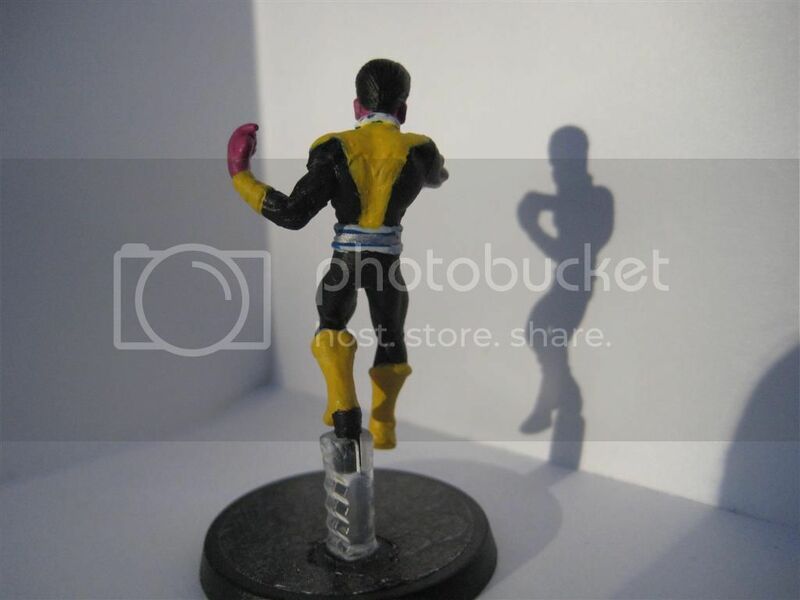 Sinestro. 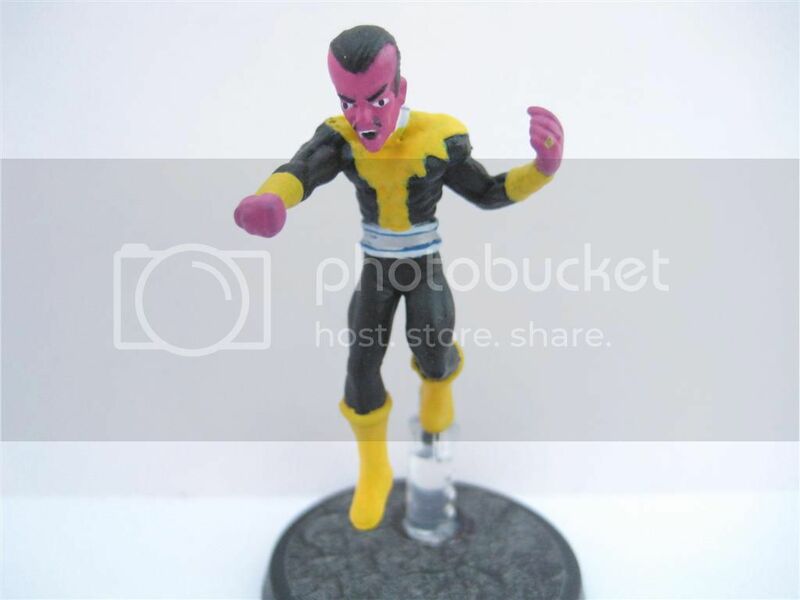 I really know next to nothing about Red, Orange, Yellow, Green, Blue, Indigo and Violet Lanterns, but I do know that the C3G Sinestro is yellow, and that the official Heroclix Yellow Sinestro is way too expensive. 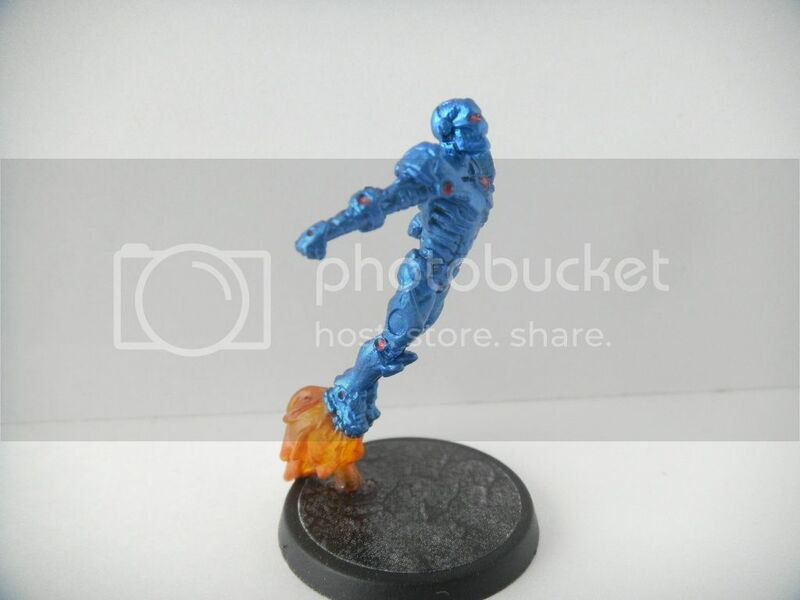 So I got the cheap blue one and painted him. 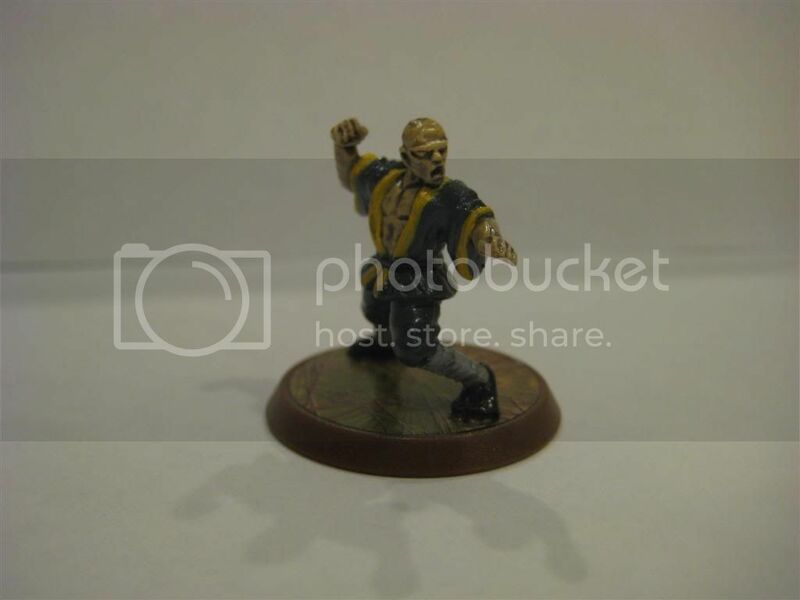 For Giant Man, I started with the large sized Yellow Jacket figure. 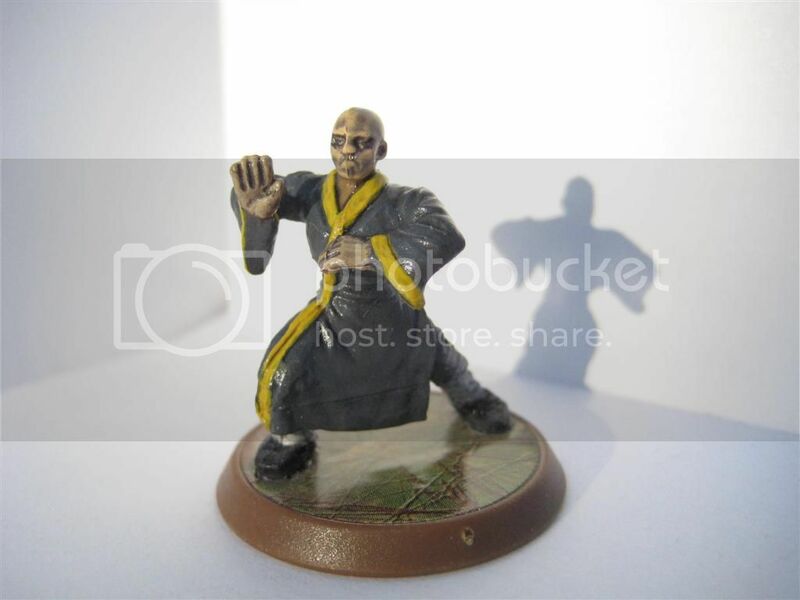 Heroclix also makes a regular sized Yellow Jacket, so make sure you have the large one if you want to try this. Next I cut off the wings with an exacto knife and then shaved them and the logo on his chest down kinda smooth with a Dremel. 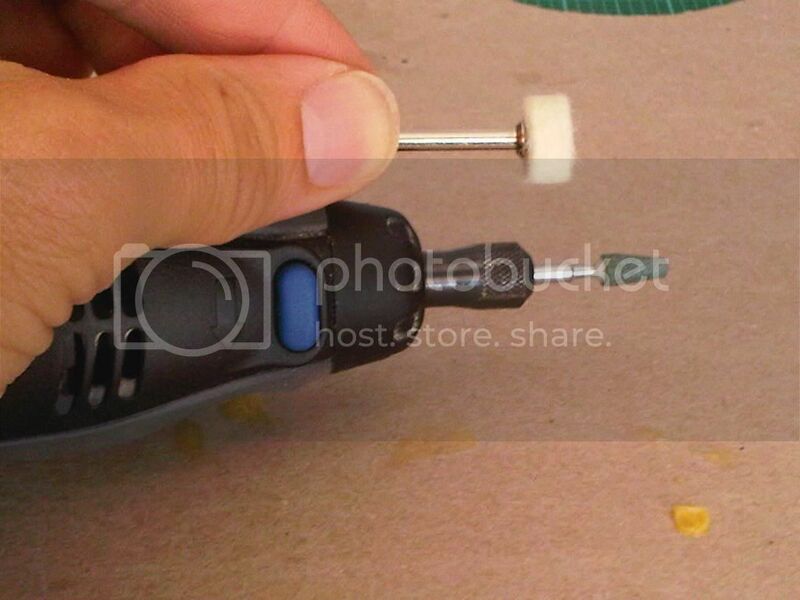 The bits I used are in the third photo below. You might think the grinder looking bit was the best choice...I thought so too...but I was wrong. The furry wheel thingy works sooo much better for doing this. Just be careful, if you press it too hard, it will wear down the figure pretty fast. The remains of the wings are perfect for the suspenders. Last I painted him red and blue and added a wash followed by a bit of drybrushing to add some highlights and lighter color to the surfaces on top of his arms, shoulders, etc. because those surfaces would be facing the sun. So making those surfaces a bit lighter makes it look more natural. 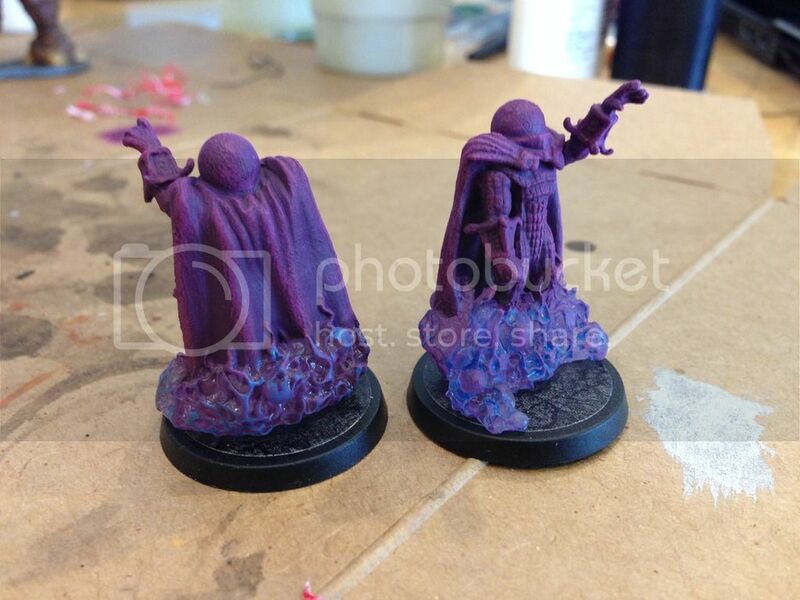 For these figures I did nothing more than add a wash. They were just so plain without them. 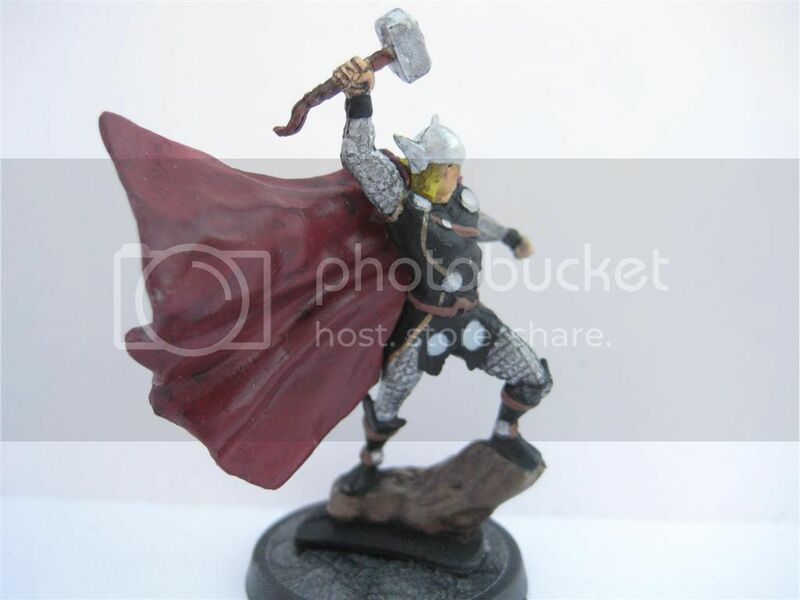 Thor's armor was just silver, so the detail of the mail on his arms didn't stand out and his cape was one solid reddish color, without any kind of shading. The wash helped immensely. 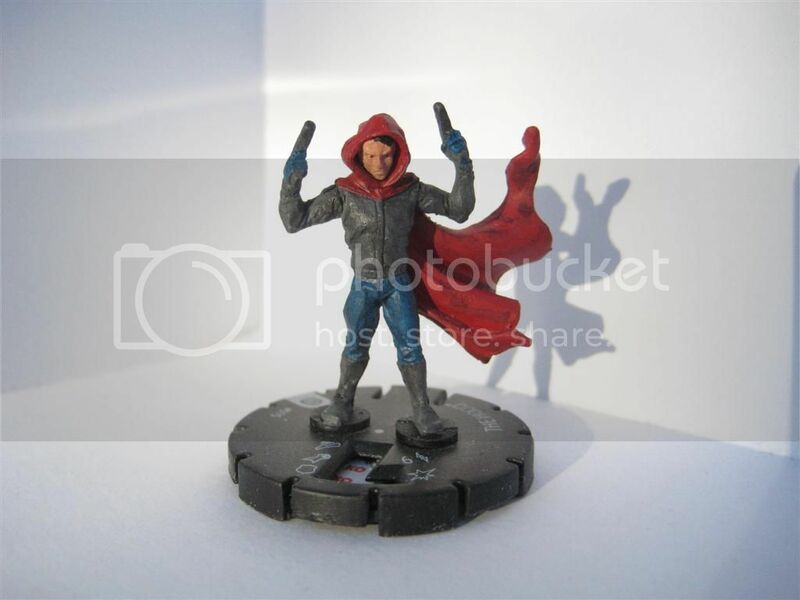 The Hood looked too red and blue before the wash, not like a crime lord guy who sneaks around in back alleys and abandoned construction sites. Again, he looks much better with the wash. These are not too difficult, basically add some grey with yellow trim. This was my first attempt at doing a wash. I learned that the wash darkens the main color significantly. This is also the first time I used a sealer. It came out a bit more glossy than I liked. I have now settled on Krylon Matte Acrylic Sealer as my preferred product. This one is pretty easy, but I tried using glossy black paint to make it look like she's wearing leather pants...the effect didn't really work out so well...but I have a Skahen! Last edited by Porkins; May 11th, 2015 at 11:25 AM. Awesome stuff Porkins! Very nicely done. Mate really top stuff . 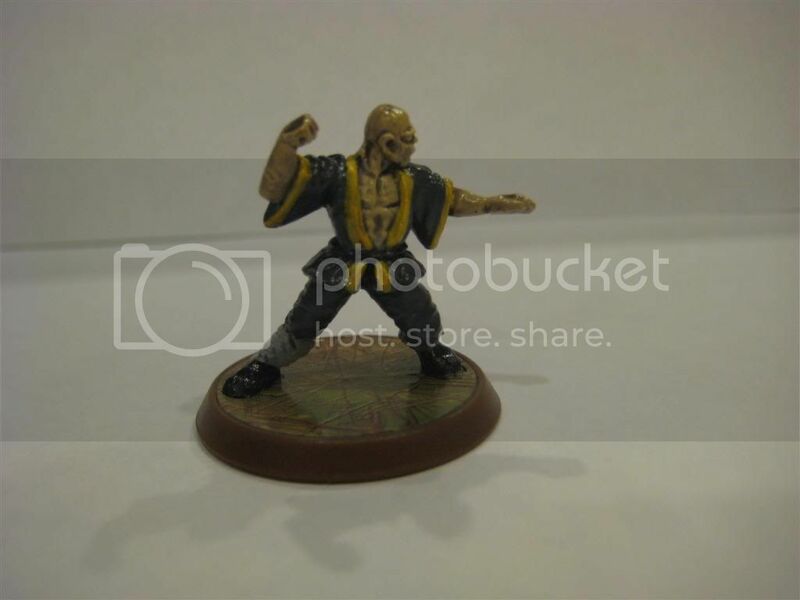 Cool stuff, I would have never guessed you were new to painting minis. These all look great! I think my favorite is the Sam Brown. The wash came out really nice. 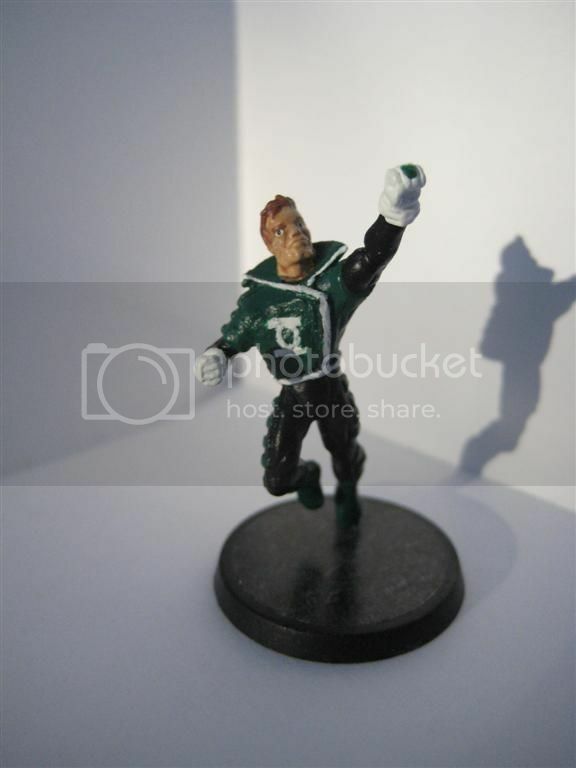 Green Lantern is awesome too. Thanks for posting your pics for us. Good card trades with Grison, Fedex worker, and capsocrates. It's kind of funny you posted this because I have a YJ figure sitting in front of me right now, about to undergo a similar transformation. 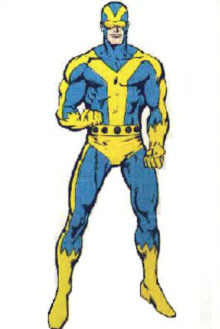 Rather than alter him to his Giant Man alter ego, I intend to put him into his Goliath outfit. I don't own a dremel so carving off his shoulder thingies and his logo on his chest are going to have to be done manually with an exacto knife. Not sure if it will work, but what the hey. 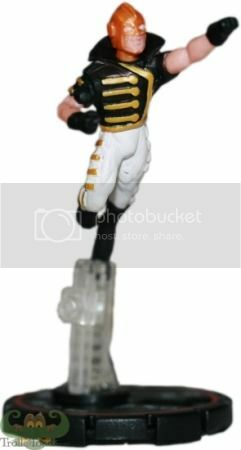 I have two extra YJ figures that are unused so they have volunteered for experimentation. 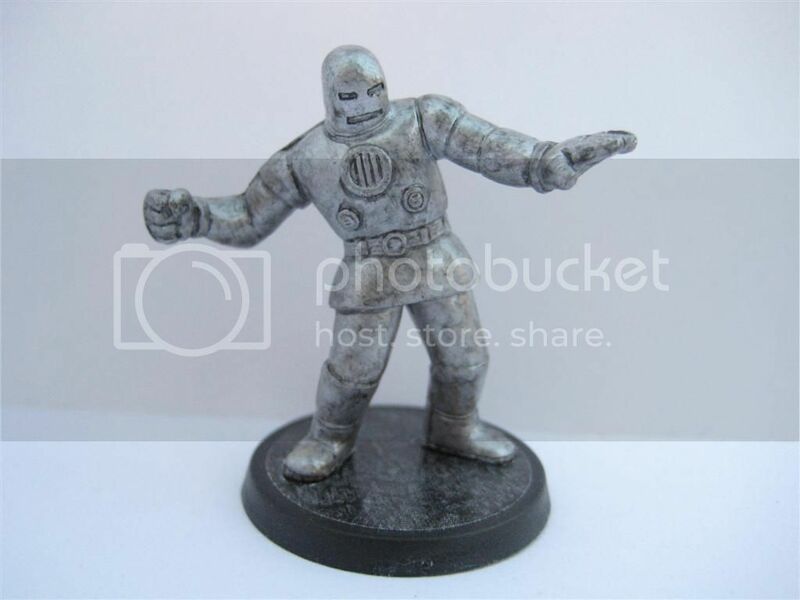 Firstly, the material this figure is made from is somewhat "rubbery" so it is difficult to make any sculpting cuts with the straight blade. This means that the suspenders will look like polygon surfaces, not smooth stretchy fabric that tends to conform to his chest. Second, some areas are difficult to get into with the blade because of the position of Yellow Jacket's arm, particularly on his right hand side. At least this was my experience. Maybe you are better at it than I am. Good luck! Yeah, I am pretty skeptical too...but am still going to give it a shot. I have a bunch of blades so I am hoping that a really sharp new blade will allow me to make a finer cut. We shall see. Sandpaper will help you out there. Cut away what you can with an X-Acto knife, then just sand down the rest. I've found sandpaper to be incredibly useful with modding minis. Added Stealth Suit Iron Man and a Treasure Chest. Currently working on a Red Hulk, Hulkbuster Iron Man and some Granite Guardian repaints from Obsidian Guards (part of a trade). 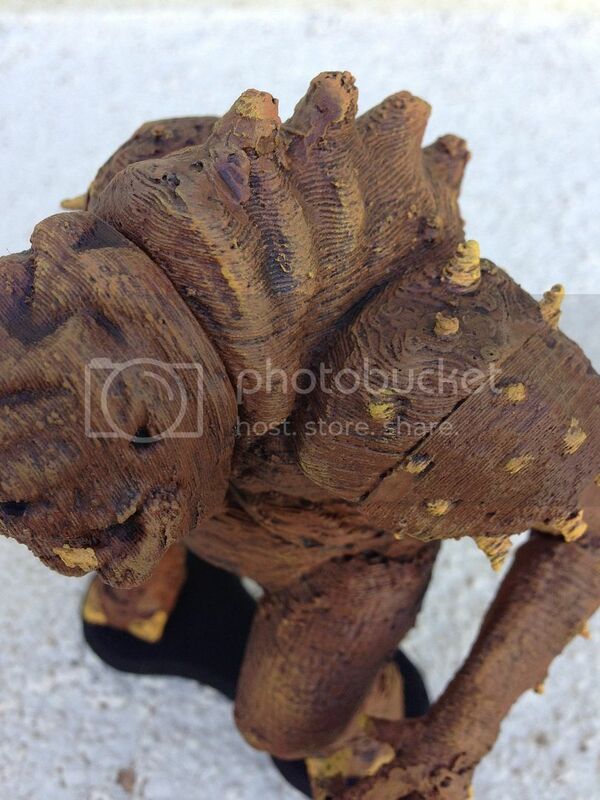 Finished my Goliath custom. I will post it once I get it based (needed to order some more bases). I did take your advice and wound up using a borrowed dremel...just couldn't get close enough with manual shaving.